BANDAR SERI BEGAWAN (April 23rd, 2012) ¾ Members of the MS Environmental Club, MS HERO (Helping Everyone Reach Out) Club, MS MP/PRS (Majlis Pelajar/Pembimbing Rakan Sebaya) alongside several student volunteers and teachers participated in cleaning up the Jerudong Beach planned by the environmental, non-governmental organization, The Beach Bunch. The event took place on a Sunday morning of April 22nd, marking a commemoration for Earth Day. Upon arriving at the venue at about eight in the morning, crowds of eager participants, including pupils from our college were seen gathering under tents and umbrellas. Out of 742 volunteers, more than one hundred participants from the Science College (MSPSBS) showed up to speak up their rejection to a polluted beach. Other schools involved were STPRI, MD, Telisai Primary School in Tutong, Seri Mulia Sarjana School, Brunei Polytechnic School, MTSSR, PTE Tutong, ISB, and JIS. Despite the continuous rainy weather, the operation went ahead at 8.30 am after being delayed for about 30 minutes. Participants were greeted by Beach Bunch Co-Founder Alan Tan, also by special guest Zainal Abidin, a Malaysian environmentalist and singer who offered a helping hand. 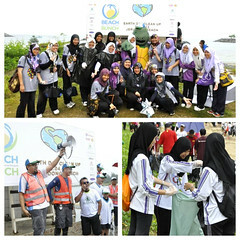 The beach was divided into 5 zones in which volunteers were assigned to clean. Science College participants were put into Zone ‘D’. The Beach Bunch coordinators explained to the gatherers that collected rubbish should be separated into 3 kinds; plastic bottles, aluminium tin cans and general wastes. Black plastic bags and gloves were also provided. Rubbish and waste materials like fishnets, rugs, ropes, tires and other various others can be seen before the cleanup started. There was also a pile of discarded and worn out house items such as pillows, comforters, cooking utensils. This showed that some Bruneians decided to recklessly appoint the beach as their wasteland. Even though the air was filled with an aroma of dead fish and shipping boat oil, each pupil worked non-stop, from end to end in reaching the same goal. There was even an assembly line composed of our helpful students rolling up a large amount of tires, allocating them smartly at one location. Students also learned that the concerned authority intends to construct an artificial coral reef at the beach via the gathered tires. As a result of full commitment and teamwork, participants were able to accumulate 4 truckloads of waste from the Jerudong Beach. Our school collected a satisfying amount of 20 or more black plastic bags of trash. The campaign ended around 10.30 am. Before departing, participants were able to share moments with Yuyu the Pesta Santai Muara mascot. Albeit persistent rainfall throughout the whole campaign, the volunteers including our pupils did not back down from cleaning. The event has taught our students and teachers to appreciate the value of nature. An event such as this also leaves an extremely rewarding and life-changing experience, as well as the satisfaction from contributing for a good cause, and cleaner environment. The operation concluded with high hopes that more of our college members will participate in the next year’s beach cleanup and that the students and staffs should be more aware of the cleanliness of their surroundings.